â€œWe are concerned about developments on some campuses this week, especially reports of violence and intimidation,â€ said President Cyril Ramaphosa said during his second State of the Nation Address (SONA). Ramaphosa opened up the last SONA of the fifth parliament of democratic South Africa on February 7. He delivered his speech in the midst of ongoing student protests around the country. FATIMA MOOSA reports. Ramaphosa extended his condolences to the family of slain Durban University of Technology (DUT) student Mlungisi Madonsela. Madonsela died at the hospital after being shot on campus during protests. Ramaphosa said the free higher education plan has been introduced for qualifying first year students. â€œThanks to this initiative, links have been re-established with all institutions, and institution heads and student leaders have played a critical role in communicating with students,â€ he said. According to Ramaphosa the scheme is being phased in over a five year period until all qualifying undergraduate students will benefit. The National Student Financial Aid Scheme (Nsfas) which has been plagued by many problems since the inception of the free education plan was mentioned by Ramaphosa. â€œStabilising the business processes of the National Student Financial Aid Scheme will also be a priority in the coming year so that it is properly capacitated to carry out its critical role in supporting eligible students,â€ said Ramaphosa. 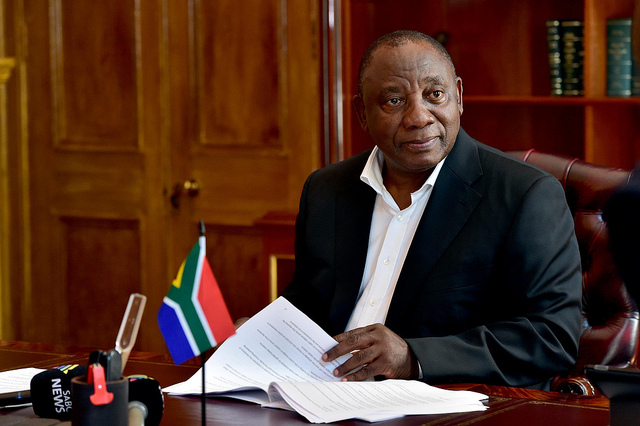 Acknowledging the ongoing protests at campuses around South Africa, Ramaphosa called upon student representatives and university authorities to work together to find solutions. He said working together they can find solutions to the challenges students are facing. He did promise that through the Governmentâ€™s Infrastructure Fund, student accommodation projects which are already underway will be expanded. Starting from January 4, students at Wits University, University of KwaZulu Natal (UKZN), Mangosuthu University of Technology (MUT), Durban University of Technology (DUT) and the University of Johannesburg (UJ) amongst others have been protesting. Students have been raising concerns about issues relating to the implementation of free education. This has been related but not confined to historic debt – not addressed in the free education plan – and lack of adequate accommodation. During his 2018 inaugural SONA, Ramaphosa promised that the free education plan announced by former president Jacob Zuma in 2017 would still be implemented. Zuma announced that the government would be introducing free higher education for poor and working-class students during the African National Congress (ANC) conference in December 2017. Ramaphosa was very sparse on details instead opting to leave it for the then finance minister Malusi Gigaba to provide more details on the plan. â€œStarting this year, free higher education and training will be available to first year students from households with a gross combined annual income of up to R350,000,â€ Ramaphosa said in 2018. During the 2018 budget delivered by Gigaba, the government promised to allocate an additional R57 billion of funding for fee-free higher education. â€œThis means that all new first-year students with a family income below R350,000 per annum at universities and TVET colleges in the 2018 academic year will be funded for the full cost of study. This will be rolled out in subsequent years until all years of study are covered. Returning NSFAS students at university will have their loans for 2018 onwards converted to a bursary,â€ Gigaba said. The 2019 budget speech – to be delivered by Finance Minister Tito Mboweni – on February 20 will be expected to hopefully iron out the financial details of the policies promised by Ramaphosa. â€œWatch the space,â€ as the President said.